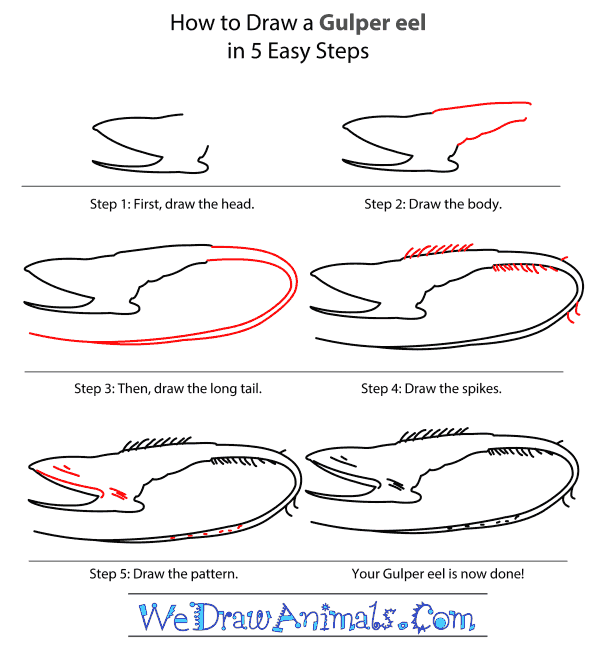 In this quick tutorial you'll learn how to draw a Gulper Eel in 5 easy steps - great for kids and novice artists. 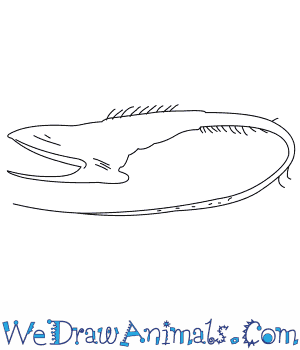 At the bottom you can read some interesting facts about the Gulper Eel. 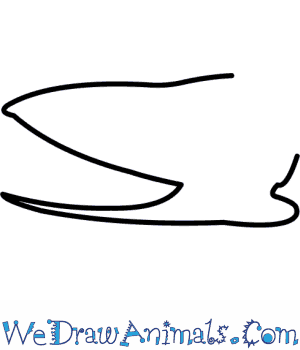 Step 1: Draw a sideways M. Connect a little upward curve to the bottom end of the M.
Step 2: Draw two horizontal lines from the ends of this shape that point slightly upward. 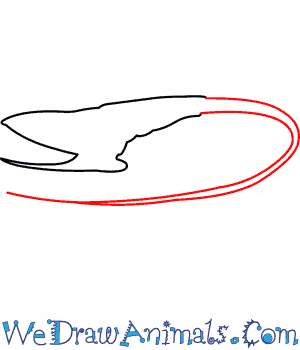 Step 3: Draw a long curve from each end that meet in a sharp point. 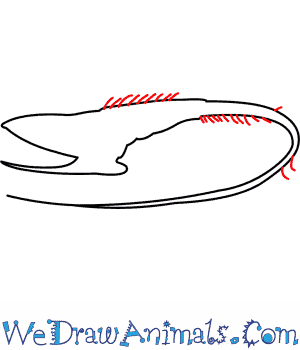 Step 4: Add short lines along the back and tail. Step 5: Add two lines near the top of the head, another along the mouth, and three lines near the end of the mouth. 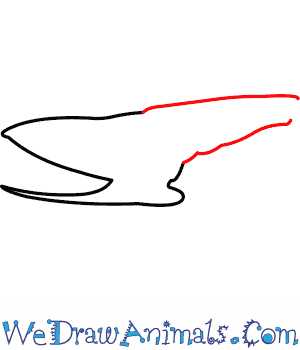 Draw a pattern of dots along the tip of the tail. You are done! You can color it in mostly black, with a paler, reddish face and markings. Gulper eels are actually fish, not eels. They got their name because they look similar. Because they live at such incredible depths, it is very hard for humans to study them. 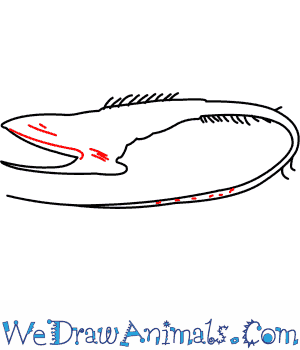 Most of what we know about gulper eels is based on specimens that were caught accidentally by fishers. Some species of gulper eels are bioluminescent! Gulper Eels are long ugly fish that live in the north part of the Atlantic Ocean. They grow to be 3 feet long and have a bright pink bulb at the end of their tails. They are mostly black and have small heads. Attached to their head is a big jaw that they open so wide they can swallow much bigger fish. Gulper Eels swim through the water using their tail like a whip. When they eat they open their mouths and gulp up whatever gets close enough. They like fish, crustaceans, and plankton. Also known as the Pelican Eel. As far as scientists known there is only one eel that has a mouth like the Gulper Eel. Scientists think the bright pink bulb on the Gulper Eel’s tail is used as lure to get other fish to swim into its mouth. It just bends itself in half and waits for food. Gulper Eel females only mate once, and then they die. In recent years, fishermen have been catching Gulper Eels in their nets. People used to think you could only find them in the deep parts of the ocean. Theme: Transform your classroom into the Atlantic Ocean! Decorate the room with construction paper waves and hang drawings of Ocean life found in the Atlantic to give your students a schedule of the lesson plans to come during the week.